Enjoy your Truly Singaporean favourites from New Ubin Seafood right to your office or home. The 3-time Michelin Bib Gourmand awardee is now available in the heart of the city, residing in the iconic heritage dining site of CHIJMES. Delvieroo: Halal food delivery plus Cashback! ShopBack also lets you in on the latest promo code so you can save even more! There's always something for everyone at Deliveroo! Order selected Indian restaurant and enjoy free delivery with Deliveroo promo! Use Shopback and earn Cashback now! Free delivery when you order delicious Indian to spice up your lunch! Let Deliveroo quench your thirst with LiHo delivery! Use ShopBack for Cashback and info on the latest Deliveroo promo! Get your bubble tea fix now! With Cashback and deliveroo promo code to help you save, there's always room to satisfy your sweet tooth with Yole! Get it delivered with Deliveroo! Deliveroo Promo: Selected vegeterian restaurant with delivery fee waived off! Live healthy by going green with vegetarian food! Order selected Japanese restaurant and enjoy free delivery! Find the latest Deliveroo promo code at Shopback and save! Get your favorite Japanese food deliver to you with free delivery! Enjoy free Delivery when you rder food from selected Italian restaurant! Look for any available Deliveroo promo code by checking Shopback often! Enjoy the elegance of Italian cuisine with Deliveroo free delivery! Thai food delivery with Cashback at Deliveroo! Find info on the latest promo at ShopBack! Get your tom yum, basil rice, green curry fix now with Deliveroo! French food delivered to you with Deliveroo! Enjoy Cashback and find the latest Deliveroo code at ShopBack for big savings! Indonesian food delivered to you with Cashback at Deliveroo! Look for a promo code at ShopBack for big discounts! Spice up your life with some Indonesian food delivered to you! Discover Mexican food with Deliveroo and enjoy Cashback! ShopBack also brings you the latest discount codes to help you save! Tacos, burrittos, quesadillas, nachos - all to your doorsteps. Explore Turkish cuisines with Deliveroo and earn Cashback! Also look for info on the latest promo code for extra savings! Kebabs, mezes, baklava and many more! Discover the latest promo code from Shopback and enjoy free delivery plus Cashback when order food from selected Chinese Restaurant! Free delivery for you to indulge the rich heritage of Chinese cuisine! Look for a discount code at ShopBack when you order pizza at Deliveroo for the biggest savings! Add a slice of happiness to your day with some great tasting pizza! Salads: Save on your orders at Deliveroo by looking for the latest promo at ShopBack plus Cashback! Get your vitamins and fibre fix at Deliveroo! 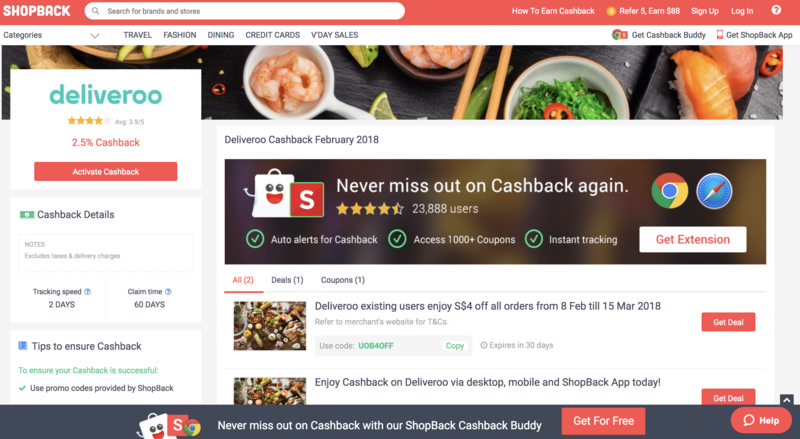 Absolute Acai: Cashback and the latest Deliveroo promo code at ShopBack! Enjoy the benefits of Acai - one of nature's superfood! London Fat Duck - Dimsum and more! Save more by finding the latest Deliveroo promo at ShopBack now! Perfect any tiime of the day! Get Cashback on Ippudo Ramen orders! Look out for the latest info on a Deliveroo promo at ShopBack! Hearty ramen to suit all tastebuds! Bergs Burger delivered to you! Enjoy Cashback and info on the latest Deliveroo promo code with ShopBack! Organic food that's better for your body! Deliveroo Promo: Save with Cashback using Shopback on your Sushi Tei deliveries! One of Singapore's most famous sushi joints now delivers straight to your doorsteps! Look for a Deliveroo coupon code to save more on your Bonta Bonta bentos at ShopBack! Spice up your day with curry dishes and enjoy savings with Deliveroo discount code! Let Deliveroo quench your thirst with Fruit Juice delivery from It's Juice Time! Use ShopBack for Cashback and info on the latest Deliveroo promo! Get your daily dose of juice now! Feel the tropic flavor of Hawaii now! Save with Cashback when you use ShopBack. Enjoy sumptuous and filling Mediterranean dish with a Deliveroo Coupon Code! Enjoy wholesome and nutritious grain bowls now! Enjoy Cashback on Deliveroo via desktop, mobile and ShopBack App today! Roasted meat: Get it delivered to you with Cashback! Get updates on the latest Deliveroo promo at ShopBack! Duck, pork, beef and many other choice cuts available for you! From 22 September 2017 onwards, you can now get Cashback for Deliveroo via ShopBack Desktop, Mobile web, and ShopBack App. Please be aware that some transactions may track at a slightly different rate, but will uplift on a monthly basis, once the transaction is confirmed by the merchant. Accounts that engage in fraudulent orders/activities to game/cheat the cashback system will be banned and Cashback forfeited. Deliveroo is a global online company that delivers food to the customers. It started in 2013, when the founder moved from New York to London. New York is a place where anything is possible, especially if you are a foodie, you can get anything right in front of your door when ordered. In London this facility was missing and thus, Deliveroo was born out of the necessity – to bring restaurants close to the customers. In various scenarios you can be tempted to order a takeaway, like you might be busy or just want to relax, Deliveroo can take that stress for you and deliver delicious food right on time with a payment that is quite affordable for everyone. This mission changed the traditional way to order food. Deliveroo brings the food you choose, to your doorstep from local favorites to nationally recognized restaurants. In an average of 32 minutes the fleet of riders from Deliveroo, brings you the food you order from hundreds of choices. The recent successful growth of Deliveroo includes operation in 100 towns and cities of UK, with 600 software engineers and employees in the UK headquarter, 800 partner restaurants and 15000 fleets of riders across the country. Based in London, Deliveroo operates in 200 cities of UK, Belgium, France, Germany, Netherlands, Ireland, Spain, Italy, Australia, United Arab Emirates, Hong Kong and Singapore. What is in the Menu and Payment Methods of Singapore Deliveroo? If you want to see the menu where you can get the food of your choice, you need to put the pin code of your area, suppose when you put the area code of Singapore, you will be directed to the page where you will see foods from the highest rating to the lowest, from meals to desserts. Choose from the restaurant option and you will get the choice for courses, delivery time and address. Choose everything and click ‘go to checkout’ for a hassle-free delivery of your food within 40 minutes at your doorstep. Once you choose the order and ready to hit the button ‘checkout’ the purchase will be done. Deliveroo insist you to go cashless. They do not allow cash payment because of various security reasons. You can add a tip for the delivery person at the time of check out or you can pay cash if you wish. You can order maximum before 24 hours in advance with a pre-scheduled delivery. The payment options: Deliveroo uses a minimum order value scheme, per time of the day. Note that all promotions are subject to ShopBack’s and merchant’s terms and conditions. Whether it’s a gloomy mood or party preparation, foodies are always in the search for the best options available in the market regarding food. Deliveroo gives the most reliable and easy solution to opt for. Always try to grab the attractive promotional deals using promo codes before it ends, which is the best option for your wallet with discounts for convenient food delivery to your home or workplace. Utilize the discounts with equally great food; an absolute win win solution. Check out the wine collection and the necessary accessories that the company offers for your convenience. Such as jute bags, ice buckets, wine glasses and more. The Deliveroo vouchers and Deliveroo coupons will be your best friend for ordering whatever you opt for. Get the best out of those deals in right time. Deliveroo coupon - $5 off first 3 orders, valid from 1st January to 28th February. $5 off first 3 orders with Promo Code ‘SAFRANEW’. Valid for 30 days from the date of redemption. Deliveroo Singapore Exclusive coupon code of SGD$8.50 off – ($5 off your first order + Free delivery and $3.50 off on your next order. Get flat $5 off on your first order at Deliveroo Singapore. Promotion is valid for a limited time. Deliveroo voucher - $6 off from first the delivery order code. The food delivery is becoming way much popular because in this fast-paced lifestyle of the Singaporeans going out for every meal is not possible. Along with, all the chains and emerging restaurants do not offer delivery option. 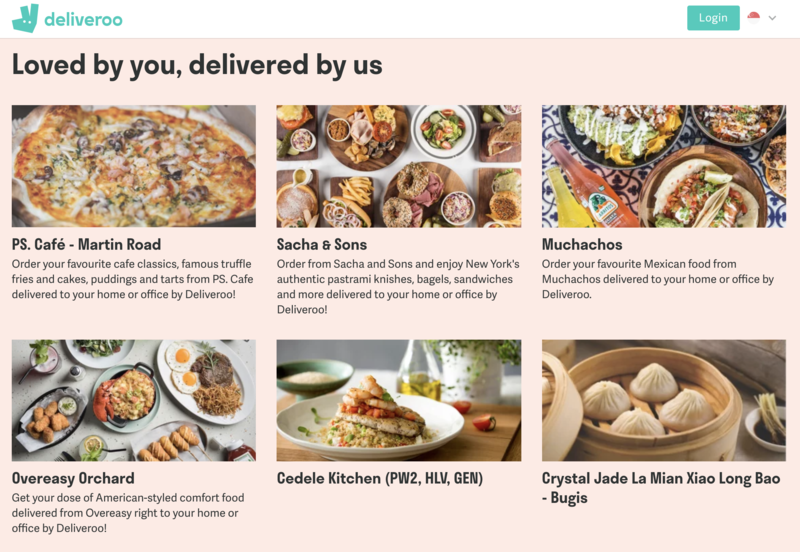 Here comes Deliveroo with its premium food service that brings food from 2500 restaurants in Singapore and delivers to homes and offices on –demand. Their 1600 riders promise to deliver within 32 mins. They are different than other delivery companies from the forefront of and logistics and technologies. From red velvet or carrot walnut cake to eggless chocolate truffle cake, from sandwiches to roasted chicken whatever you want to eat or whatever may be the time of the day you want to order, everything is possible through Deliveroo. The amazing deals which you get makes purchasing a fun option for you. You can get many enjoy cashback on top of Deliveroo discount codes, promo codes, and coupons from ShopBack. Card holder saving facilities: American Express cardholders have a coupon code for them to enjoy free deliveries for the first 4 orders. They also get 2.5% cashback but this promo is valid only for the new Deliveroo users. Simply input the code while you check-out. CITI cardholders can enjoy 3x free deliveries while using the promo code together with their card through Deliveroo via ShopBack, plus they get 2.5% cashback offer. New Deliveroo customers, on their first food delivery service can get an SGD$6 discount. All they have to use is the code SHOPBACK6 when they will checkout. These promo codes and vouchers has expired dates. In an on-going promotional offer, Deliveroo customers can purchase a cash voucher worth SGD15 at only SGD$2. At a discount of SGD$13, this will be divided into first 3 orders which mean you can get SGD$5 discount on each order. If you order through the Deliveroo app using the ShopBack deals it guarantees for 2.5% cashback. Download the app via ‘Play Store’ to get more exciting order promos. You will get a sure cashback for all the transactions made with the Deliveroo Shopback page via desktop or app. Earn great discounts by Deliveroo deal on top of the Deliveroo cashback from ShopBack! Sign up and enjoy the cashback for Deliveroo via mobile, desktop and Shopback app. Get acquainted on the latest Deliveroo Black Friday and Cyber Monday deals at ShopBack! All these year-end shopping making you hungry? Why not get some food delivered to you with Deliveroo this Black Friday and Cyber Monday. Don't worry, it's not only on electronics, fashion and beauty that you can save on this Black Friday and Cyber Monday - not if ShopBack can help it. ShopBack aims to bring you information on the best Deliveroo Black Friday Deal or Deliveroo Cyber Monday Sale to make sure you save on food too! So shop with ShopBack now to enjoy the bes and latestDeliveroo Cyber Monday promo code or Cyber Monday deals! Use your Deliveroo voucher codes, coupon codes and promo codes on the website and app. If you are using the website to order, enter the code while you check out. In case of the app, enter the code in the box ‘Enter a Promo Code’ and enjoy the luxury of saving upon great delicious foods and beverages. If you want to think about gifting food and beverages, Deliveroo does that too for you. In any occasions such as anniversaries or birthdays and more, Deliveroo can transport the ordered hot meals and melting deserts right where you want, to the person whom you love. It also delivers alcoholic beverages and liquor from top reputed restaurants. An interesting fact about the company is, it’s the first food delivery service in Singapore to deliver meals by bicycle. It is definitely an environmental friendly solution in the form of delivery system which reduce pollution and make shortcuts at small roads to shorten the delivery time not less than 20 minutes. Deliveroo is flexible regarding the cancellation of order by their customers in a reasonable time. That means it should be before you see the status ‘Started Order” in your account. Once you see that status, you cannot cancel the order, because the partner restaurant has already started using the ingredients to prepare your ordered food. You can always properly inform Deliveroo or the partner restaurant to cancel the order and you will not be charged. Payment will be reimbursed with the same method you have used to pay. Once there is the status of ‘started order’ there will be no refund. In summer 2017 Deliveroo announced a plan to keep its riders safe. A new app was introduced with a feature for the riders to raise security concern. From December 2017, the riders had the access to the first ever different kind of insurance scheme for different riders in UK. The company has expanded its service in the area of breakfast, express lunch, corporate order, alcohol and exciting deals to its special partners like Pizza Express. The service will be expanded much more with the utilisation of new fund in both new and existing markets. A further investment in the remote kitchen initiative ‘RooBox’ has been planned to make from the fund. RooBox is an idea to give delivery-only kitchen in various key locations. They have also introduced a smart tool called ‘Pushme’, which gives the bicycle riders an extra help to climb those tough hills effortlessly. From spring 2018, there will be brand new battery swap stations called ‘Pushpod’ which will help to retain the battery power anytime. Deliveroo has an option to chat instantly which is helpful to know about the current status of your account. When you go to the ‘contact’ tab on the main website, you get that option named ‘Deliveroo Support’. You will be asked to enter your delivery order ID and email address you use to log in to your account. You can email to [email protected] or make a call at the number +6531637074 for any question or concern and customer care support. Other food related merchants you should also check out at ShopBack are Honestbee, Foodpanda and many more!